Ribeye steak, is one of my absolute favorites. In fact, I’ve often heard them called “the chefs cut”, because the pro’s prefer them for their great marbling which brings both more flavor and a very tender texture to the meat. These Certified Steak Ribeyes deliver on all points, and I loved making them. Ribeye’s are perfect for rubs and sauces, so for this recipe, I do a simple Southwest inspired rub, sear them off on a grill pan, and then serve them up with a yummy chimichurri sauce, that’s filled with fresh garlic and herbs. I’m happy to be working with such a great ingredient, and I’m sure you’ll love these ribeyes too. Use the thickness of the steak to determine how long to cook it. 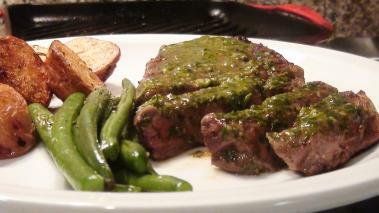 If the steak is less than an inch thick & your pan is hot enough, it will only take ~2 minutes a side to get to med-rare. Cook thicker steaks longer, thinner steaks faster. Adjust the time, don’t adjust the heat. I love big red wines with steaks. Given the slightly sweet spice rub on these ribeyes, I think a Zinfandel would go really well. Or as an alternative to keep it all in Latin America, try an Argentinian Malbec, which have similar characteristics as their more famous and more expense Bordeaux cousins, and will go great with these ribeyes. Enjoy!